Jerky is one of the staples of multi day hiking and camping trips, and one of the best lightweight high protein foods around. 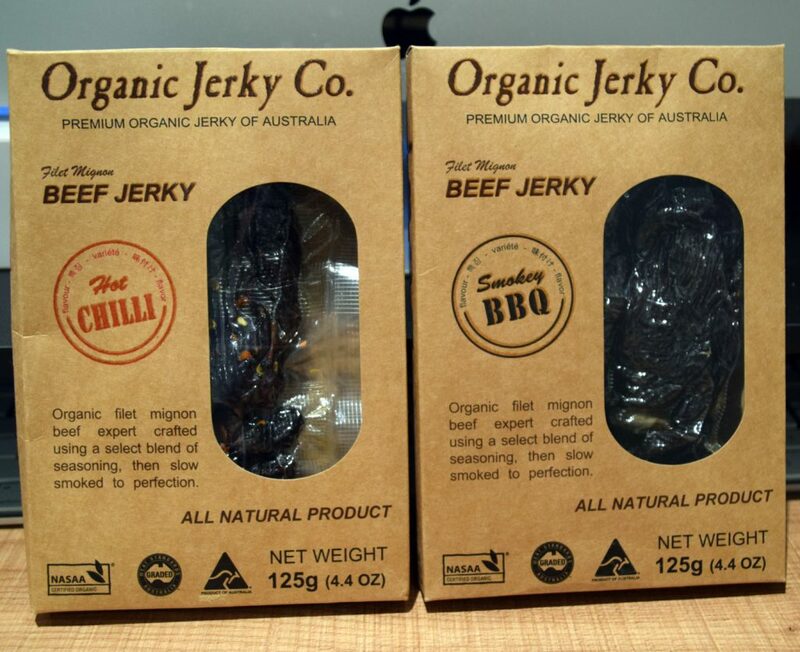 I have tried most of the beef range from this Australian company, Organic Jerky Co., with the exception of the mild curry which was by choice rather than for any other reason. This review applies only to the Beef Jerky range as I have yet to sample the other types of jerky available which includes salmon, crocodile and kangaroo. I don’t tend to bother with jerky on single day trips but for any multi-day trips jerky is part of my staple diet. From my own experience I find that over a two week trip my food tastes change and I will go off jerky during the middle of the trip before having cravings for it towards the end of the second week. I will usually allow 4o grams each for my wife and myself per day and generally we won’t have any leftovers. Rather than eating all the jerky in one sitting I will graze on it throughout the day. The nutritional information on the pack suggests 25 grams per serve which means there are five servings per pack. The weight is as advertised and the random packet I opened for this review was 124 grams which is about as accurate as you are ever going to get. The taste of the Organic Jerky Co. offerings are very good, and I have made my way through the readily available beef flavours. This range is free of artificial flavouring that a lot of supermarket or service station products tend to have. If I’m honest, I don’t have a particular preference out of the different beef varieties but can say that after two weeks I do appreciate the variety. 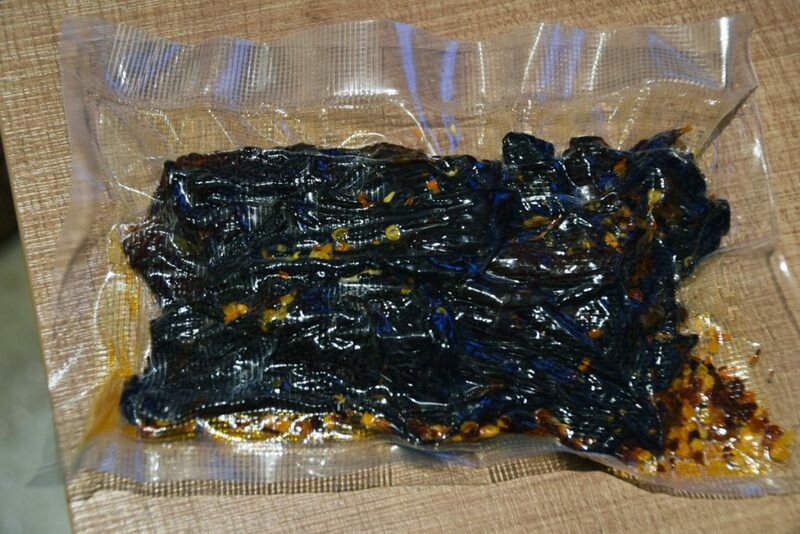 Be warned, the chilli beef jerky can be a little hot for some particularly if you eat all the loose dried chilli in the packet. 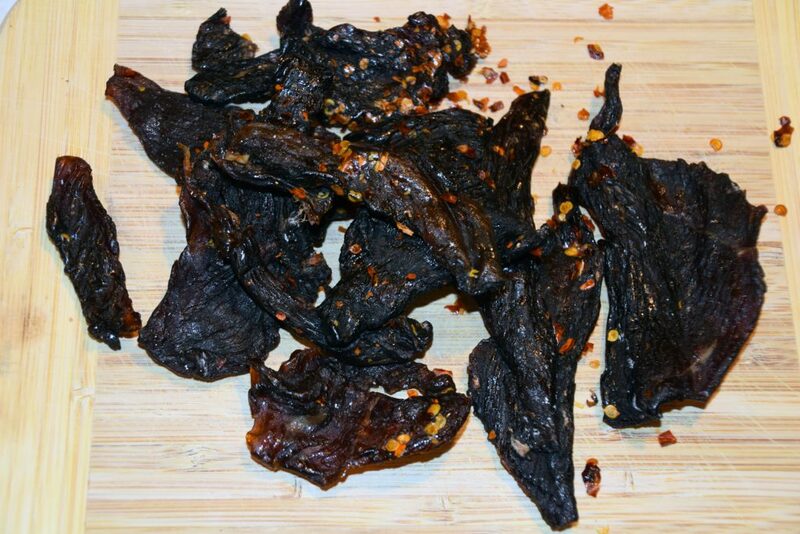 Beef jerky is one of those foods you have to work at chewing as dried meat takes a bit of effort to break up. An obvious negative of beef jerky is the price as you are starting with an expensive base product. Given you are not consuming huge quantities at any one sitting, this is usually not a major factor. The Organic Jerky Co. sells to customers directly online and while a purchase of just one pack is expensive they do offer bulk deals which brings the price down considerably from $19/packet to $11.90/packet. Still dearer than the service station offerings but as the saying goes, you get what you pay for. This product is what its advertising says – organic beef without the preservatives and additives of cheaper products. When I place my online order my delivery arrives within a week which is good to know if you need a delivery in a hurry. Delivery is also included in the price regardless of the quantity ordered and is a nice change from the practices of a lot of online and bricks and mortar stores. This is a great product and well worth considering for longer trips where fresh food options are limited. The Organic Jerky Co. is definitely my go to choice for jerky in Australia. Packaged beef jerky from the Organic Jerky Co.